Carnival Love Wall Detroit is the second iteration of a modular projection mapping work consisting of dozens of small animated elements that can be assembled, much like toy blocks or Legos, to create a complete animated surface that can be remodeled and shaped to accommodate almost any architecture and/or structure. This work was presented as part of the Dlectricity 2017 festival in Detroit, Michigan. 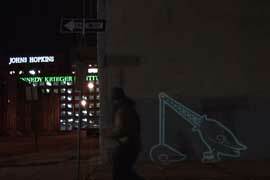 It was projected at the Meyer J. Prentis Cancer Center in Mid-Town Detroit. Carnival Love Wall is a modular projection mapping work consisting of dozens of small animated elements that can be assembled, much like toy blocks or Legos, to create a complete animated surface that can be remodeled and shaped to accommodate almost any architecture and/or structure. Carnival Love Wall celebrates the resulting complexity of deceptively simplistic systems, like a molecule, a living organism or an entire community. Taken singly, each element’s motions are simplistic and repetitive. But when joined by many others and contained within an architectural form, they are much greater than their constituent parts, creating a monumental, dynamic, and playful mosaic of motion and color. This image is a maquette of the recent install of Carnival Love Wall for Animafest Zagreb World Festival of Animated Film, at the Museum of Contemporary Art Zagreb in 2017. The dome is an architectural feature that is common to a wide variety of social spaces. Its strength derives from the natural forces of gravity and tension, with each tier held in place by force exerted from above while supported by the one below. Though this mutual support, these hemispheres of stone, brick and iron are capable of enclosing vast amounts of open space, unoccluded by columns or other supports. One of the first achievements of architectural engineering, domes appear in almost every culture, across every age, and serving a diversity of functions. Utilizing archival imagery and animation, Babel takes advantage of David M. Brown Planetarium’s domed ceiling to present a 5-minute tour of the iconic structures and institutions that boast this architectural feature, placing viewers beneath the oculus at Rome’s Pantheon; gazing up at our nation’s Capitol Building; and amidst the gorgeous lattices of Tilla Kari Madrasa in Uzbekistan, to name a few. In Babel, the artist stacks the different rings of these domes like children’s toys, aspiring to build a towering edifice, one atop the other. The domes, however, spin in consecutive circles, and each level erodes and supplants the next in a futile architectural battle royale spanning centuries, geography and ideologies. As the Tower of Babel presents an allegorical origin of cultural difference, Babel suggests that an ideal monument is one that brings together all ideals—faith, pleasure, beauty, industry—that the balance and tension of these paradigmatic forces allows them to coexist while supporting one another naturally, like tiers of stones stacked to form a domed ceiling. Rejecting a monolithic, homogenized absolute, Babel represents a unity that does not subsume social and cultural difference, but builds on the strength of all its constituent parts. In Babel the sacred, secular, commercial and political work in concert to realize the best of all possible worlds, all at once. BABEL was first presented at the David M. Brown Planetarium in Arlington, VA in May 2017. It features the song “Many Horses” from For Stars and Atoms, an album by the excellent yet sadly defunct Baltimore ensemble Yeveto. Projected Aquaculture is a large-scale projection mapping animation created with Kelley Bell and Corrie Francis Parks for Light City Baltimore 2016. This 5-minute looping animation was projected on the 250-foot-wide canopy of the IMET center on the Inner Harbor in Baltimore from March 28-April 4, 2016. Through a whimsical approach to animation, the piece presents the underwater ecosystem of the Chesapeake Bay, drawing parallels between the decline and resurgence of the Bay’s health and the similar decline and recent efforts to transform Baltimore into a livable city. Projected Aquaculture examines and comments on the current health of the Chesapeake Bay through a series of projected animations incorporating imagery from the delicate ecosystem such as fish and blue crab. Mapping these projected images in large scale offers an opportunity to create a dialogue around a similarly described ecosystem: Baltimore City. Viewers were invited to interact with Projected Aquaculture through printed and online resources, including a field guide and a Bay Bingo game and Field Guide where they could learn about the underwater flora and fauna featured in the projection. 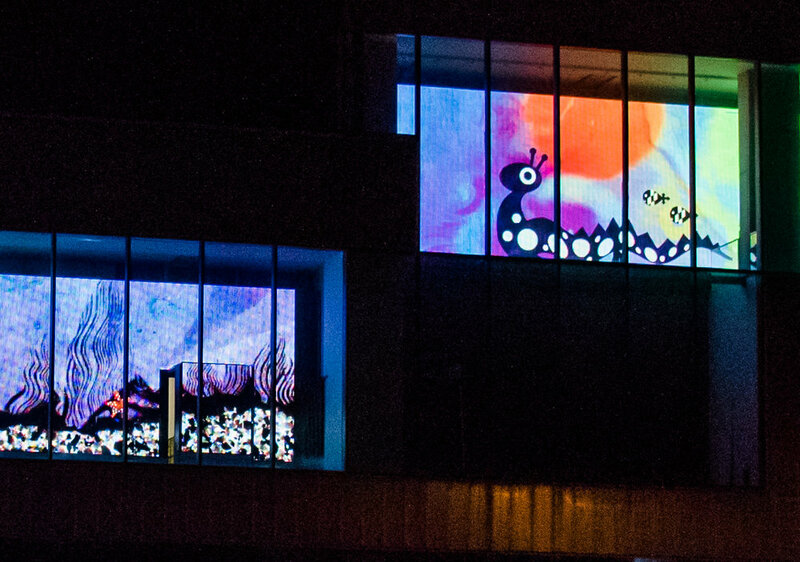 A second configuration of Projected Aquaculture, a 3-channel video installation for the Museum of Contemporary Art in Zagreb, Croatia appeared at the international animation festival Animafest Zagreb’s Animation Goes MSU video mapping programming. 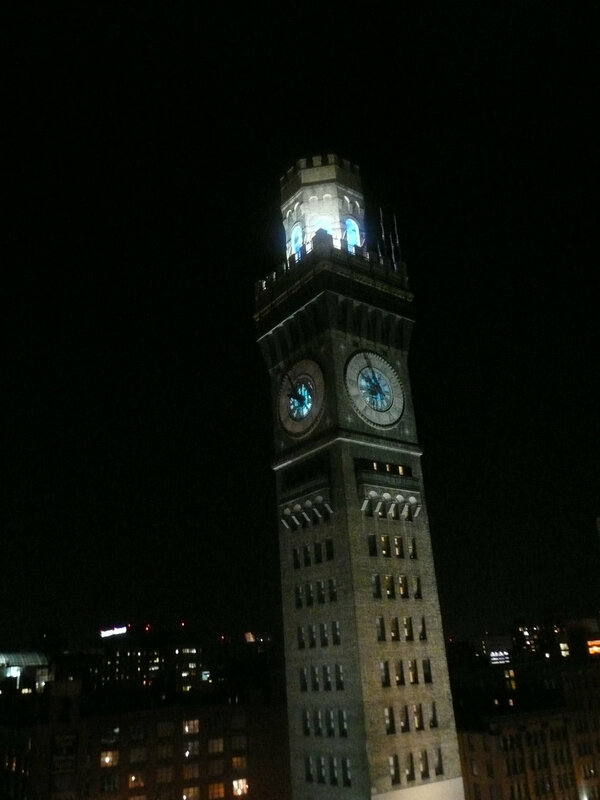 The projected work, presented in partnership with the Baltimore Office of Promotion and the Arts is a series of short animations designed for and projected within the historic Bromoseltzer tower in downtown Baltimore City. 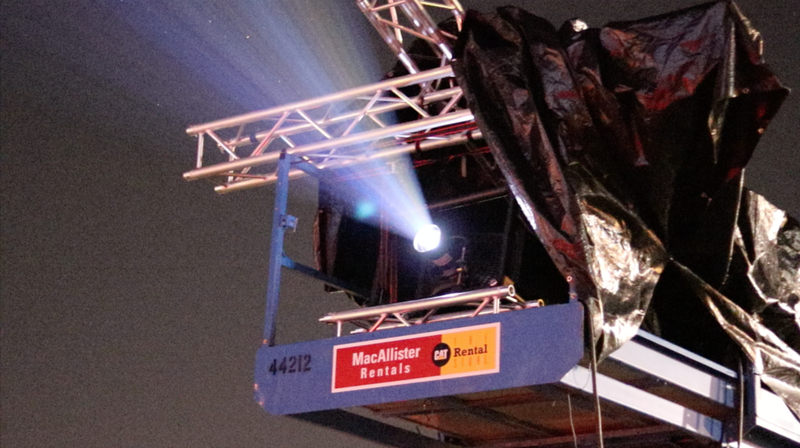 Using three data projectors controlled by a laptop computer, the artist projected moving images from inside the clocktower and through three of the four faces of the clock. The unique setting of the Baltimore Landmark's clockwork room presents an artwork that can be enjoyed from within the tower, or from outside, seen for long distances across the city skyline. The video documentation contains images from the opening of the piece in July 2011, and footage taken from within and outside the tower. The artist also completed a number of printed posters to commemorate the special occasion. The Clock Strikes 100 was designated “Best Public Artwork” in Baltimore Magazine’s “best of 2011” issue. For an article about this project in the Baltimore City Paper, see here. For an article about this project in the Baltimore Sun, see here. The Oracle is an interactive video installation that celebrates (and lampoons) our faith in technology and it's seemingly endless progress towards a better future. The Oracle is a fantastic spectacle that provides answers to the user's fears and anxieties through the miracle of modern machinery. The installation combines animation, light sensors and a projector to create a fortune-telling machine that responds to queries submitted to it on small pieces of paper submitted by the viewer. It consists of the projected animation of the oracle, the projector itself, and a "petition box" containing a light sensor that triggers the answers to the solicited questions. The artist created nine separate animation loops, each a answer to the question presented by the user. Using Max/MSP and an Arduino microcontroller, she modified a speakerʼs podium to serve as the input for the device. When a question is dropped into the box, the computer randomly accesses one of the nine animations to display a reply to the question. The Oracle has appeared in numerous group shows and the solo exhibition Heavy Light Machinery in 2012. A video installation presenting an animated “device” explaining the Kubler-Ross Model, based on Elisabeth Kubler Rossʼs “Five Stages of Grief” in her book On Death and Dying. This device is a “miraculous modern mechanical marvel that transmutes the painful memory of a lost loved one to a joyful memory, allowing the deceased to shuffle off this mortal coil, and enabling the living to have the courage and intestinal fortitude to carry on.” The animation itself is presented as a sculptural piece within the gallery, as opposed to screened in a theater space before a seated audience. The Kugler-Ross Device has been presented in several group and solo exhibitions. Immersive Ideal was an interactive exhibition of photographs and music documenting the Washington, DC, band Beauty Pill’s summer residency in Artisphere’s Black Box theater. The goal of Immersive was to re-create the experience of the band’s week-long summer recording session in the Black Box through an all-encompassing interactive environment of imagery and sound—a hyperreal panorama of the creative process. A listening space enclosed the viewer within three rear-projection screens. In the center of the space, an array of unmarked buttons on a pedestal controlled an array of photographs from the band’s recording sessions. As the band’s music swelled to fill the space, the user was free to manipulate the ebb and flow of images from the original performance of the work, presenting an “immersive ideal” of the original event. Raw documentation of recent projection piece, Ironclads at the 2012 InLight projection festival at the Tredegar Iron Works in Richmond, Virginia. Ironclads resurrects the ghosts of the great ironclad ships of the Civil War in tribute to the Tredegar Iron Works. The ships silently haunt the waterway, gliding in and out of each other's view, never meeting again after their first (and final) historic encounter. Thanks to the 1708 Gallery and to Dan and Ian of BVC. A unique modern device for the transmutation of abstract thought into concrete objects. Harnessing the mysteries of chemistry and the power of mechanical movement, The Eureka Machine captures dreams, enfleshes desires and makes the unreal incarnate. The Eureka Machine has appeared in numerous exhibitions, and is part of the guerrilla projection series, Projected Ephermera. Below is an image of a patent model made for the exhibition Heavy Light Machinery in 2012. 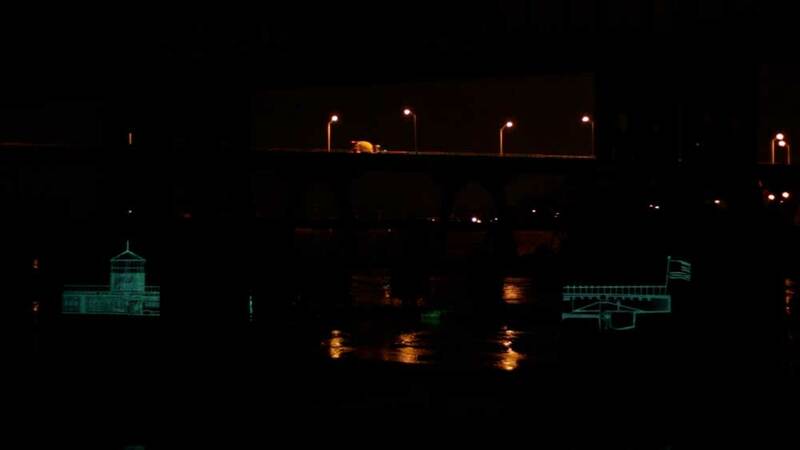 An animation and subsequent series of public projections at sites in Baltimore City over the course of a month in 2008. “Rise and Fall...” explores the life, death and rebirth of the Charm City though the growth and shedding of its many facades over the course of time, and the fleeting permanence of history through words and text from the city’s past. Rise is about reading the city as a text—quotes regarding the history of Baltimore, taken from historical sources such as Thomas J. Scharf’s The History of Baltimore City to the words of present day city residents. The letterforms of the text become the bricks and mortar of the city itself, put up and torn down again and again by the (literal) hand of history. The animations were projected onto buildings at sites where dramatic socioeconomnic change was taking place—demolition sites, newly minted condos and industrial ruins. These projection events were then documented, presenting images in which the city’s past overlaps and illuminates it’s facades in present day. 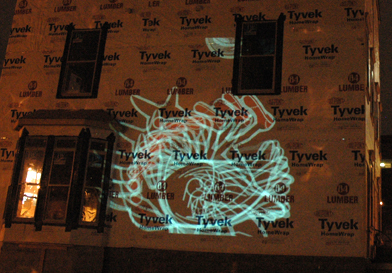 In my final thesis work at University of Maryland Baltimore County's Imaging and Digital Arts Program, I projected digital animations of the Raven, an archetypal trickster figure, on the buildings of Baltimore. I performed ‘shoot and run’ screenings in the city’s public spaces. These animations highlight issues of a city in transition: disparity caused by gentrification, the artist’s role in community growth, and the uncertain future of historic structures in the face of rapid urban re-development.